Spuntino, in Italian, means a snack or a casual, easy-going neighbourhood spot to eat and drink, and Nico’s Spuntino Bar and Restaurant is a new Italian restaurant which offers a variety of rustic, snack-size dishes that represent different regions of Italy. Opened by the Staunton’s Group, Nico’s is located in Soho where Fat Angelo’s used to be. These days, small, intimate restaurants are in vogue, so we found it quite liberating to be able to dine at a restaurant whose interior is spacious and homely, featuring a relaxed bar area and an airy dining room. Having been thoroughly impressed by Da Polpo in London, a hip restaurant which serves Venetian-style “tapas” to be shared, I was delighted that Hong Kong finally has its own Spuntino, and was immediately excited by Nico’s vibrant menu. 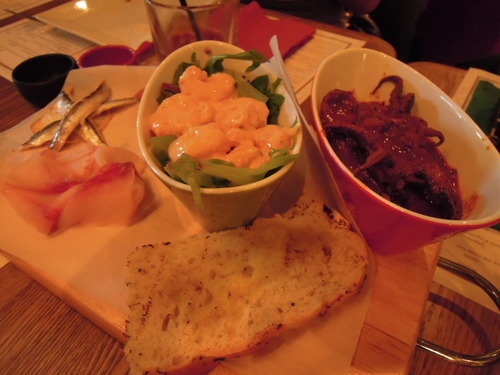 (1) Our evening started with a Seafood Antipasti platter ($188). The spicy baby octopus had a firm texture and a spicy kick, and the selection of smoked fish had a fatty, complex flavour. The platter also consisted of garlic focaccia, marinated fresh anchovies, and a shrimp cocktail. 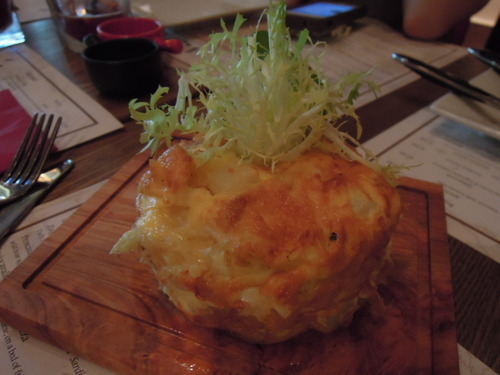 (2) The Frittata ($38), which was a caramelized onions and potato omelette, left me quite happy. I liked the fluffiness of the eggs, which was matched with the softness of the potato. A hint of sweetness from caramelised onions added a nice touch. (3) We were mildly shocked by the fact that you could choose from a choice of crocodile, calamari, prawns, capelin and oyster for the Crispy Breaded Goodies ($108). Were we ready to eat some crocodile? Turned out not, so we stuck with plain old calamari. 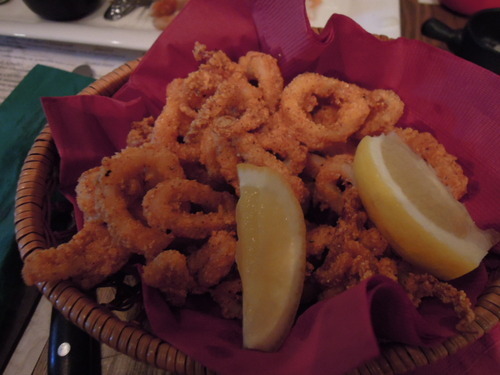 The calamari was deep fried in crunchy batter, and we drizzled some lemon juice on it. I happily munched on this dish while having flashbacks of the ticking crocodile in Peter Pan. (4) Fried cheese always makes me feel blissful, so I could not resist ordering a portion of the Caciocavallo Silano in Carrozza ($98). 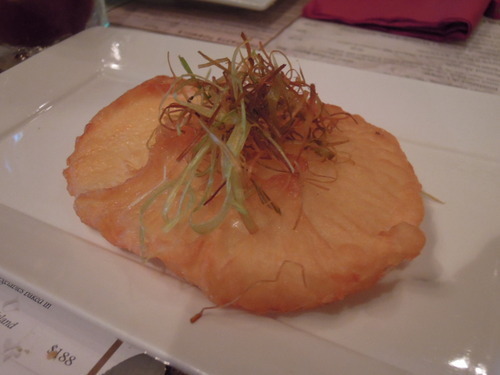 This crispy-fried, fresh cow’s milk cheese was stringy and chewy, and was gorgeously crunchy on the outside. It was funny, though, how C thought that it was a piece of fried fish at first sight! 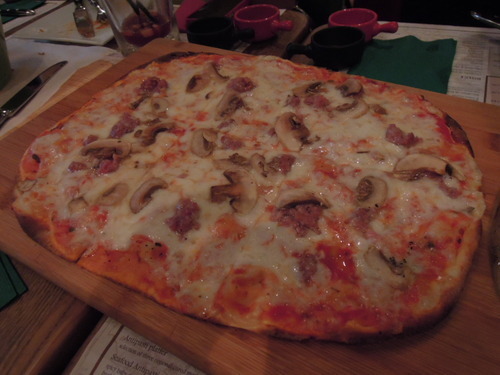 (5) We were faced with a variety of pizzas on the menu, and decided to go with the waitress’ recommendation. This Mamma Assunta’s ($118) was topped with tomatoes, mozzarella, fresh pork sausages and white mushrooms. The mozzarella was delicious and alluring, and the pork sausages were succulent and tangy, but there were too few pieces of them! 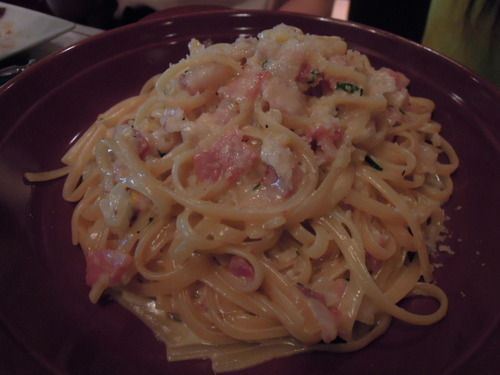 (6) As I adore freshly made pasta, I very happily tucked into this Carbonara Panna e Prosciutto ($158), which had a fresh cream and egg yolk sauce and was scattered with tempting pieces of Pancetta Bacon. 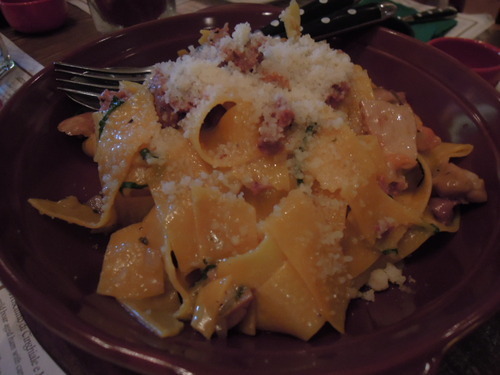 (7) It was, however, the Pappardelle Salsiccia & Porcini in Bianco ($178), which really stood out. It was done exactly how a hearty Italian pasta should be done – the pasta was perfectly al dente, it was simply seasoned with olive oil, pepper and cheese powder and had in it scrumptious chunks of pork sausages and porcini mushrooms. It was authentic, and was reminiscent of the pasta that I had in Bologna, the food capital of Italy! 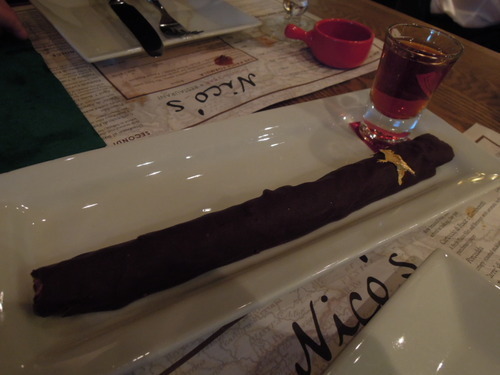 (8) We were a little bit unimpressed with the meat dishes at Nico’s. 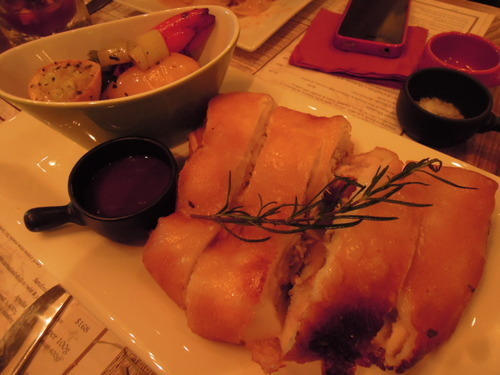 The Porceddu ($188), which was a crispy-roasted suckling pig served with honey gravy, had an inch-thick layer of fat. I am not an advocate for lean meats, but this suckling pig was even more greasy than pork belly! Since when did little piglets become obese? 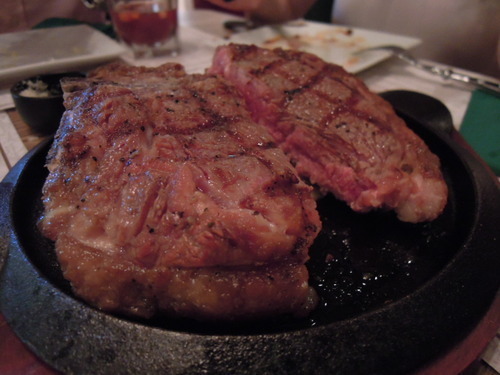 (9) The Aged T-Bone Cut to Order ($390) was smartly served on a metal plate. The steak was magnificently grilled, and was indeed sizzling hot when it was served, but the texture was a bit too chewy. The roasted rosemary potatoes at the bottom, however, were moreish. (11) A crepe is not something to be turned down, no matter how full one is! 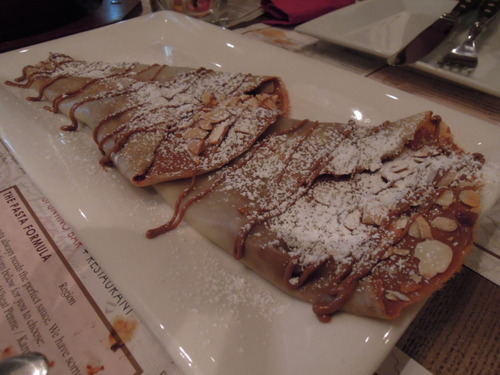 We ordered this Nutella & Nuts Crepe ($68), and we all liked how it had lots of nuts in it, giving it an excellent crunch. Crepes, to us, are always worth every calorie! Conclusion: We liked the casual and unpretentious vibe at Nico’s and its hip, small-plate fashion, but there was certainly room for improvement on the food. 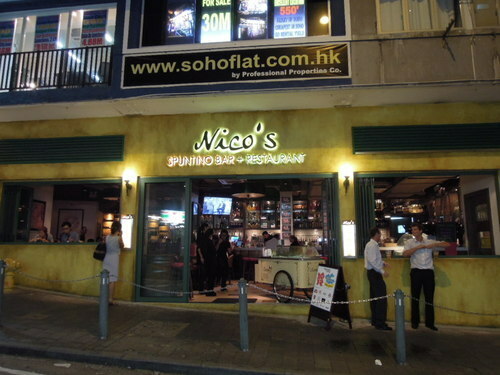 An average dinner at Nico’s would cost around $300-400 per person, which is average for a restaurant in Soho. What is worth a mention is that as we were having dinner, a few of my friends concurrently suggested that I should give this restaurant a 3-★ rating in my review, which I found really cute! I completely agree, and 3★s is exactly what Nico’s gets from me.